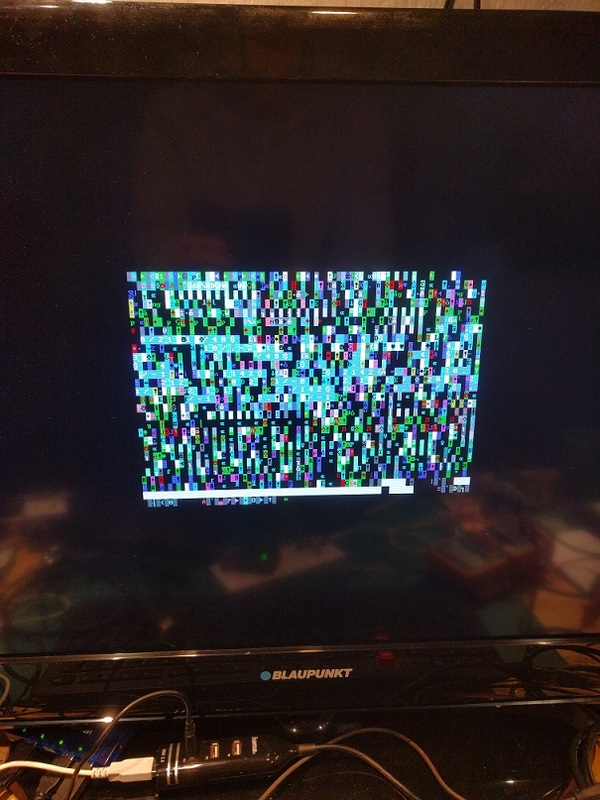 I have a problem with the VGA_textmode module in F32C. I tried both https://github.com/f32c/f32c and Xarx's F32C branch. Both with the same behaviour. I used the project ldf files supplied from the git trees, regenerated the pll and ddr ipx modules. Any hints what could be wrong? I'm using Lattice Diamond 3.6.0.38.4 64bit on a 64bit Win7 machine. Going back to 2f7075f6182254b6cd76312c6fcfa93e6b6d5d70 from https://github.com/f32c/f32c and i get a working F32C system. I have chatted with one of the F32c project maintainers (Xark) and he provided an explanation of your problem..
What you are seeing is perfectly normal for the latest F32c build. Reason why you are seeing random garbage on-screen, is because the latest F32c SoC (system on chip) design now includes an option to use external SRAM (which is now default setting) to store text, not just BRAM as per the earlier controller..
C_mem_size := 2 to (at least 4). Due to upgrades to the F32c video controller your test sketches may also not be up to date. I would suggest you download and try the latest test sketches from the "f32c/Arduino" top-level tree from github. Thanks again! Yeah, there are so many "generic parameters" it is hard to keep them all straight. I totally need to write up a bit more about the VGA_textmode ones. However, as configured by default as Valentin mentions it is using 8KB of BRAM just for font data, and has a text screen and 16-color bitmap coming from SRAM. If you try the File|Examples|f32c_VGATextConsole|f32c_VGAConsoleFeatures you should see the screen cleared (at least for a bit before it on purpose puts some "garbage" there to demo scrolling). 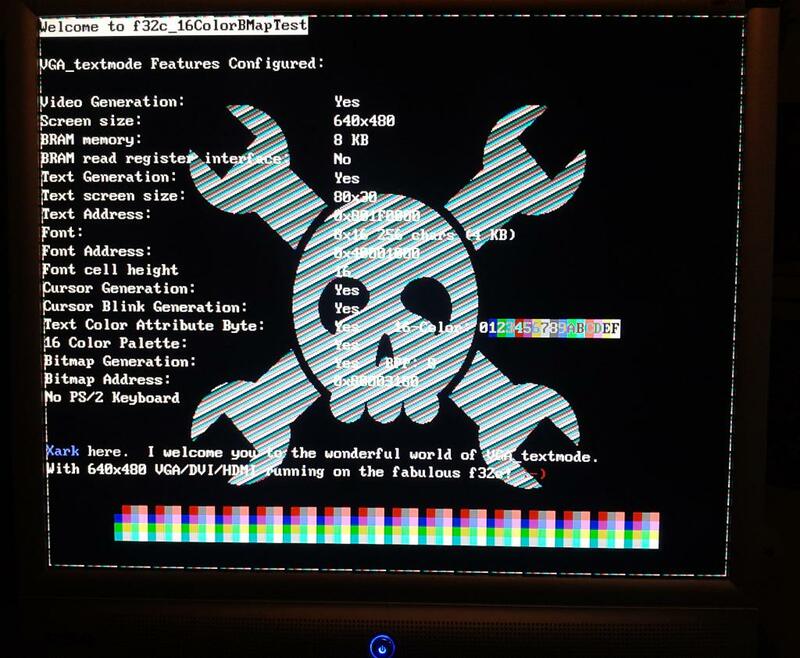 For a slightly better example, I have just updated https://github.com/f32c/arduino f32c_VGATextConsole library with another example called "f32c_16ColorBMapTest". Sorry about the lack of documentation (and a "moving target"). The f32c_VGATextConsole library does have a fairly complete set of "helper functions" to use the VGA at run time (and detect its configuration).